Virginia (Gigi) Zub (GZ) and I sat down at Rhapsody’s Victorian Coffee House to talk about her campaign for School Committee for the Franklin Biennial election scheduled for Nov 7, 2017. GZ: We have been in Franklin for 16 years. My husband had bought the house as a starter home, little did he know that when he met me and we got married, that I would fall in love with it and the area. Franklin has a really good reputation for its school system. It is not perfect; everybody has their issues. My brother (Mike Caple) had been teaching here and helped start the Franklin Arts Academy, so we knew something about it. We got married at St Mary’s, reception at the Franklin Country Club, and have been here ever since. We have no desire to go elsewhere, it is a great community. Our kids went to Parmenter and are now at Remington Middle School. I made a brief appearance in the Opening Dance of School Principal Dancing video. You know this is all important serious stuff but we also need to have fun and create an environment where all can thrive. Principal Brian Wildeman does a really good job at that. My husband and I were both born overseas. I was born in Naples, Italy and then raised in Bridgewater, going through the school system there. My husband was born in the United Kingdom and went to the American School in London. He didn’t come here until he went to Worcester Polytechnic Institute (WPI). We have this sort of international worldview outlook, not just Franklin, MA and I think that is important. We had gone back to visit the school in London. They had the American curriculum there but what they did was amazing. We still have furniture in the house that my husband made when he was in school. They had a proper shop. They made stuff. Kids could come in collaborate and work together. So I have this world view on education and I think that it is important to be involved in my kids’ education. GZ: This unique background combination as a parent, which I think is an important qualification, being in the corporate education, and the things I can bring from that world. I think this is a plus to bring to the School Committee. The company I work for just built a new learning center, using groups that are more learner centric. I manage the team that creates the curriculum. We have some staff that does the teaching or we bring in subject matter experts from the business to lead the class. We use smart boards just like the schools do. That corporate experience, and managing a large budget, while it is not my favorite thing to do, it is an important one. How do you spend your dollars? You can talk about priorities but until you put dollars to the item, it is not likely to happen. So, we were just at a presentation at Remington. They used a smart board and were hesitant to advance to the next item because they weren’t sure it would work. Now that is training, that is support. Are we providing the right amount? Money doesn’t solve all the problems. Are we using it wisely? Are we being creative? This is one of the things I like about Dr. Ahern. She is asking what are we doing with corporations? What are we doing with grants? How are we doing other things to help supplement the budget? GZ: I know a 2 ½ override is a hot button. I am not sure it is the answer but I do think that everything should be on the table. We should have a conversation about our goal. What is our goal? Is our goal to give our children the best education? Which includes really good teachers, really good classrooms, support from the community whether you have kids or you don’t have kids. We need to create an environment where our children can thrive. That is my mantra. Creating an environment where every child, every person, has an opportunity to thrive, our teachers, our administrators, so that we can be successful. At the end of the day, they are going out into society to do something. We’d rather the something be good. We live less than 2 miles from Remington and we don’t get the free bus. So I as a parent am I going to pay about $700 for the two to ride? Okay, no. It took me a few extra minutes to get here today as I got stuck in the traffic. What are we doing? We have one of the highest bus fees around. Even the $50 fee per kid to do the activities. For some families that is a challenge, that is a big expense. One other challenge is how to involve more of the community? 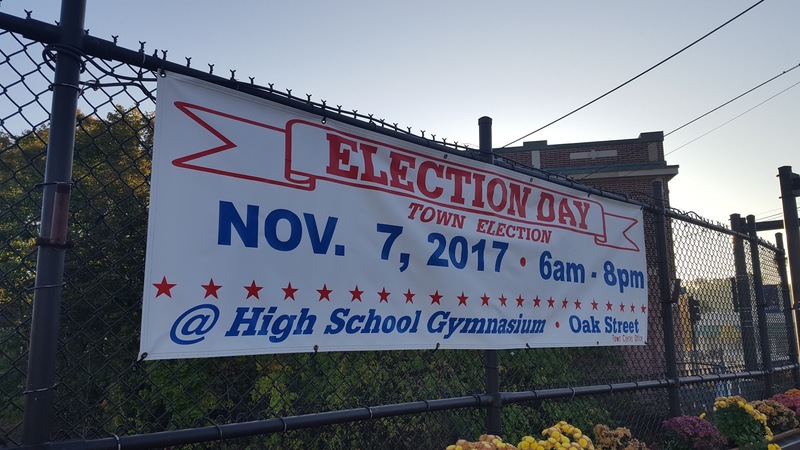 When I started thinking about running for this, I went to a couple of the Community Relations coffee hours, and to a couple of the School Committee meetings. One I went to was the budget reading. Not sure why I picked that one. I was the only citizen in the meeting full of principals and other teachers and school personnel. I was really surprised at how little the community was involved. They were all there and then when the budget was finished, they left and I was alone. It is interesting that we don’t have much engagement. So how do we improve that? I would say that Denise Schultz, Vanessa Bilello and Anne Bergen have done a fabulous job with community outreach. I’d like to see us not only continue but increase our engagement. You see it in a corporate environment too. I can’t tell you how many emails get sent out that no one pays any attention to. You should send the message in multiple channels, multiple times, to get it across. Until it catches their attention, maybe speaks to them, addresses the “what’s in it for me?”, the message is lost. Long term we are getting to a point where we are going to have a budget crisis. We can’t address that if we only have the seven-member School Committee in the conversation. We should think about what that story is and get that message out. So, it is the budget, and how do we get the community involved, those are the two major challenges. A bunch of stuff falls underneath those two. Inclusion, what do we do about start times and end times for school? If our objective is to have the best effective, valuable educational experience we can have for our kids, how do we do that when the science is telling us that what we are doing goes against what they need? At Parmenter, the PCC bought the school supplies for each student. I never had to do so. We (the parents) did the fundraising of course, the PCC did the work. At Remington, I got a list of supplies needed. I was surprised. So how can we do that better? Can we get the PCC’s together to make a more equitable experience across the schools versus one school doing better fundraising than another? I don’t think challenges like this are insurmountable but it does take a significant amount of work. I think involvement of the community beyond the seven members of the School Committee is the key to getting anything. So how are we going to do that? So, I bring my experience as a parent, in corporate education, having an elementary education background, a different perspective, and the world view we discussed earlier. I do think it is important for us to think about the goal of providing our kids an education so that our kids can contribute to society in a global way. I am not just a Franklin, MA citizen. I am a citizen of the United States and of the globe. I think we should look at all of that and not just our little piece. How do we make sure we have a consistent educational experience across the district? I think standards are important. I don’t particularly think we need to worry about the standardized testing and whether their kid can test properly or not, I think we need to assess. How do we assess versus test? Learning has always been a passion for me. It is not that I have lots of free time (not that anybody does really) but it is something I am passionate about so I want to see that my own children and the children in the community have a really good educational experience. I think it is important to get new people involved with what we do as a school committee. I think if we tend to have the same people over and over again, that’s not good. It is good to have continuity but I also think it is even better to have new ideas.